The father of JYJ member Micky Yoochun and his younger brother Park Yoo Hwan passed away on March 14th, 2012, the two brothers sent off their father final leg in tears. The burial ceremony of Park Yoochun and Park Yoohwan was held on the morning of the March 16th, 2012. As early as 6:40am at Seoul Banpo-dong St. Mary’s Hospital, Park Yoo Chun and Park Yoo Hwan walked out of the door, holding the spirit tablet and portrait of the deceased respectively. JYJ member Kim Junsu and the surviving dependents carried the coffin of the deceased followed behind, Song Jihyo and many other friends and relatives also sent off the deceased tearfully. 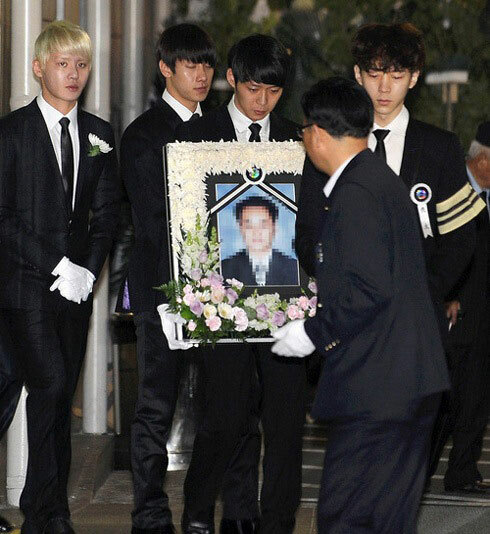 The funeral ceremony began when the sunrise, Park Yoo Chun and Park Yoo Hwon teared silently, and the surviving family, friends and colleagues followed behind also choked back tears and boarded the hearse, make the fans on the side sad. The funeral rite was done according to Buddhist way. After the deceased cremated, the ashes will be placed in the Seoul Memorial Park. The father of Park Yoochun siblings passed away on the morning of of March 14th, 2012 due to illness. Park Yoochun who was on his world tour at South America rushed back after hearing the news, and together with his brother receiving the mourning guests. Because of the sudden death of Park Yoochun’s father, the filming of SBS TV series Rooftop Prince scheduled on March 15th, 2012 is temporarily delayed.